Shawn McDonald has not always been this fired up and passionate about Christ. In fact, just six years ago, McDonald was living in a world of drugs, alcohol, and wild parties, and felt about as far away from God as he thought possible. After hitting rock bottom in college, Shawn came to know the redemption and forgiveness in Christ Jesus through the prodding of his roomate. Although Shawn never before had an interest in music, he now found himself singing God's praises both day and night. Placing all trust in God, Shawn followed His leading and was eventually asked to sign with Sparrow Records. McDonald has now released two records and was named among the "10 Artists You Should Know" in the April 2005 issue of CCM magazine. McDonald grew up in Eugene, Oregon and was raised by his grandparents after his parents abandoned him when he was just a young child. The anger and hurt over these circumstances only grew as Shawn aged, and he eventually turned to drugs as a way out. "I can't communicate how crazy I was," Shawn says. "Who I was then and who I am now is like night and day. You name the drug and I was selling it and doing it. I was a confused kid, and my confusion boiled up into bitterness and anger. My life had become a hard, closed shell. I was extremely rebellious, miserable, and lost. What God has done in my life in the last six years is amazing." When Shawn's grandparents sent him off to college, his drug addiction and party lifestyle only worsened. Meanwhile, McDonald's roomate was a Christian and tried like crazy to show him that God had a better life for him. Every Sunday, for seven months, Shawn was invited to go to church. Unfortunatly, it took his second bust on drug-related charges for him to finally realize his need for God. For the three years after Shawn committed his life to Christ, his hunger for God was out of control. He couldn't get enough, and spent nearly every spare second he had stydying the Bible and reading any book about God that he could get his hands on. Worship became highly important to him and he eventually began writing his own worship songs. His friends encouraged him in this and Shawn soon found himself singing in coffee houses. More and more people followed, and within a short time, McDonald was approached by Sparrow Records. 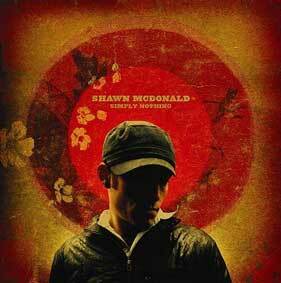 In 2004, Shawn McDonald released his debut album, Simply Nothing. The title expresses what Shawn feels his life would be like if God's love weren't at the center of it all. His need for God is immense, and that is reflected throughout the album. 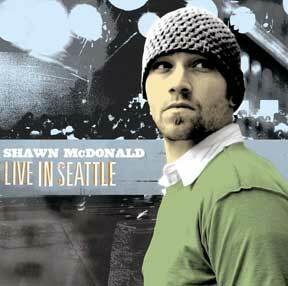 McDonald's 2005 release, Live in Seattle, was recorded in his hometown and shows off his unique acoustic-soul sound. This twelve track collection features songs from both past and future albums, including "Gravity," "All I Need," "Without You," "Beautiful," and more. Shawn McDonald's live shows are quite personal and have virtually no set agenda. He sees his concerts as a conversation between him and the audience and therefore just speaks and sings from his heart in whatever way he feels led at the time. One thing he always does, though, is share his testimony. He hopes that it will be an encouragement to his fans and give them hope that Christ has something better for them, if only they are willing to take the step of faith and follow. Six years after being overtaken by drugs, Shawn McDonald is now living a life of peace and joy in Christ Jesus. The pain of his past is still very evident in his life, but he has found new ways to deal with it. Although he has some communication with his Mom now, his relationship as a whole with both parents is still very hard for him. He is thankful to have God by his side and daily rests in the knowledge that God will never leave him or forsake him.